Carly Buchanan’s “happily ever after” takes a nosedive when, after fifteen years of un-wedded devotion to the man now nicknamed “Captain Prickard,” he boots her from their home so his new girlfriend can move in. At least Carly still has her sweet dog, Trixie. In need of moral support, Carly invites her sister and two college friends to join her at a lake house near the small town of Alpine Grove. 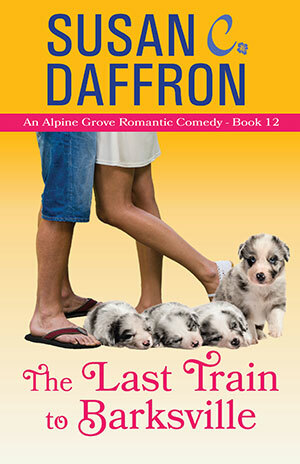 The tranquil escape turns complex when Carly and her friends discover a stray dog that’s just had puppies. After enlisting the help of reluctant next-door neighbor, Brent Michaelson, the women set out to rescue the pups. Brent has retreated to his family’s lake cabin to overcome a creative block that threatens to derail his art career. The last thing he needs is his refuge to be overrun by a rambunctious litter of noisy, spotted puppies. But who can resist puppies in need? As secrets are revealed, Carly’s summer vacation might not be the self-reflective interlude she expected, but maybe a little furry chaos, intrigue, and romance is exactly what she needs.